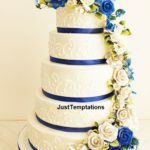 Just Temptations deliver cakes throughout the Toronto. We specialize in providing beautiful and luscious cakes. We make cakes and cupcakes for different occasions and from the finest ingredients. Everything is done by our highly experienced production team. A cake is a must for every occasion such as birthday, anniversary, baby shower, wedding etc. 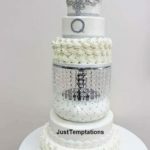 Our wide selection of cakes include wedding cakes, anniversary cakes, birthday cakes, shower cakes, cupcakes, baptism cakes, pastries, chocolate fountains, sweet tables and communion cakes. Wedding Cakes: A wedding is an occasion that all family members wait for. It is a once in a lifetime. With a tempting and delicious wedding cake, ensure that you fascinate your friends and guests. Birthday Cakes: Birthday is a very special occasion for everyone. We provide a wide range of contemporary cakes to make your celebration more exciting. Our professional chef strives to make modern designed cakes. Dessert Tables: A sweet table is a fantastic way to serve dessert to your guests. Treat your friends and guests with luscious cakes and handmade sweets. We will leave a joyful memory to you and your guests. Anniversary Cakes: Nothing spells your love for a person better than a beautiful bouquet of flower accompanied with a luscious cake. Think beyond jewelry, gadgets and expensive clothes. Get a delicious cake for your partner this year’s anniversary. Shower Cakes: Welcome your new born baby with something special. Make your special day more special with our shower cake range. We design cakes to match the theme of the party. We make your happy moments memorable. 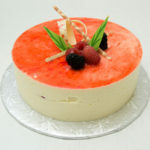 Just Temptations have been a well-known destination for people who want quality cakes and other baked items in Toronto. 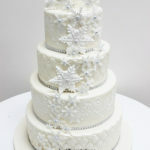 We pride ourselves as the leading bakery store in Toronto for designing cakes for different occasions. Pick your favorite cake from our hand crafted range. We understand that you want to make your every occasion memorable. That is why every time we put extra efforts to make a cake for you. We provide a huge range of items that are sure to bring joy. We never compromise on quality. Why not make your every occasion special? Get in touch with us to know more.